Yes, they threw ANOTHER house out the window, this time in Berkeley. The Berkeley Public Library Foundation hosted what can only be described as a gala, and I was lucky enough to receive an invitation. The official title was the 8th Annual Authors Dinner, held on Feb. 6. 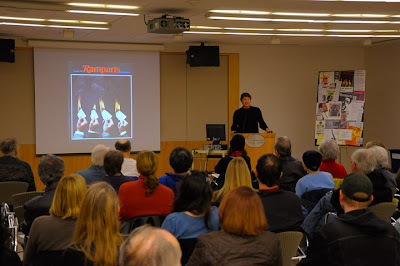 Attendees included Michael Chabon, Michael Lewis, Novella Carpenter, Mollie Katzen, Joyce Goldstein, Abraham Verghese, Ernest Callenbach, Frances Dinkelspiel, Geoffery Nunberg, and other accomplished authors. 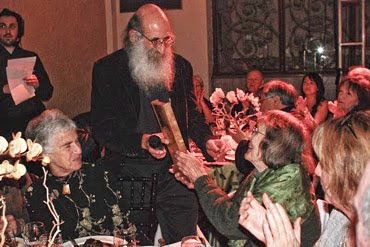 Malcolm Margolin received the Pat & Fred Cody award (above). Also in attendance was Mal Burnstein, former attorney for Ramparts and a former board member of the library foundation. As it turned out, my table was populated by the staff of the Berkeley Patients Group, a medical cannabis collective. We were joined by Berkeley City Council member Darryl Moore. Man, that was fun for me. Jonathan Hall of the San Francisco Public Library threw the house out the window (as my students in Texas used to say) for the Ramparts event on Jan. 23. Jonathan and his staff put together four posters with Ramparts clippings, covers, and memorabilia--you can see one of them in Michael Sexton's photograph. Jonathan also made the shrewdest observation of the day, noting that if Ramparts had been a New York magazine, there would have been a Broadway musical about it long ago. I was gratified to see lots of Ramparts folks at the event, including the Hinckle family (Warren, Denise, Pia, and Hilary) as well as Gretta Mitchell, Steve Keating, Reese Erlich, Jeff Blankfort, Fred Gardner, and Guy Stilson. David Weir and Cherilyn Parsons of the Center for Investigative Reporting were also there, as was PoliPointPress author Lisa Maldonado. Also some family and friends. A nice culmination. This just in: Robert Fulford of the Canadian National Post weighed in on the Ramparts book in this opinion piece. He describes the magazine as "the most exuberant, effective, foolish and hysterical expression of New Left feelings." Further evidence, if any were needed, that the magazine continues to function as a kind of Rorschach test.